C and C++ developers have used the scanf() family of functions (scanf(), sscanf(), fscanf(), etc.) as a quick and easy way to parse well-structured input. The basic idea is to be able to specify the format of an input string in a way that allows the function to extract fields from that string. For example, if your input string is "X123 Y456", you could specify a format string of "X%d Y%d" to extract the two numeric values, 123 and 456. The "%d" tells the function to extract a decimal value at the current location. The parser reads the decimal value until a non-digit character is encountered. The values are then assigned to variables and returned to the caller. In this example, the X and Y are character literals. These are characters in the input string expected to match the same characters in the format string. Processing stops either when the end of the format string is reached, or when characters in the input string cannot be processed according to the format string. To be sure, there are limits to this approach. For example, you wouldn't use scanf() to parse source code. It works best will well-structured input that can readily be defined into fields. .NET developers who like the regular expression classes can use those classes for parsing well-structured text. 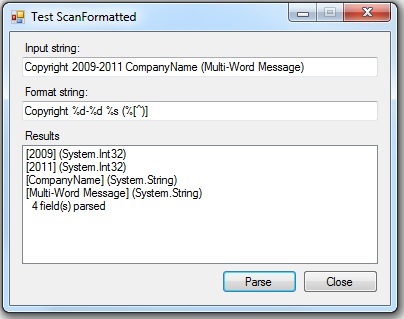 However, for cases where scanf() works, or for developers who are accustomed to using scanf(), it provides a simple and convenient way to parse many types of text. The scanf() format string provides a flexible way to describe the fields in the input string. Although there are standards, different C compilers seemed to have slightly different rules about the meaning of some parts of the format string. The following definition is for format strings used by the class I'll present in this article. Whitespace Any whitespace characters in the format string causes the position to advance to the next non-whitespace character in the input string. Whitespace characters include spaces, tabs and new lines. Non-Whitespace except percent (%) Any character that is not a whitespace character or part of a format specifier (which begins with a % character) advances past the same matching character in the input string. Format specifier A sequence that begins with a percent sign (%) to signify a format specifier, or field, that will be parsed and stored in a variable. A format specifier has the following form. Items within square brackets () are optional. The following table describes elements within the format specifier. * Indicates that this field is parsed normally but not stored in a variable. width Specifies the maximum number of characters to be read for this field. modifiers If supplied, modifies the size of the data type where the field is stored. If not supplied, the default size is used. Supported modifiers are listed below. hh: For integer fields, the result is stored in an 8-bit variable. Ignored for floating point fields. h: For integer fields, the result is stored in a 16-bit variable. Ignored for floating point fields. l For integer fields, the result is stored in a 64-bit variable. Floating point fields are stored in a double. ll Same effect as the l modifier. width Specifies the maximum number of characters to include in this field. type Specifies the field type as described in the following table. c Reads a single character. If a width > 1 is specified, an array of characters is read. d, i Reads a decimal integer. Number may begin with 0 (octal), 0x (hexadecimal) or a + or - sign. e, E, f, g,G Reads a floating point variable. Number may begin with a + or - sign, and may be written using exponential notation. s Reads a string of characters up to the end of the input string, the next whitespace character, or until the number of characters specified for the width has been read. u Reads an unsigned decimal integer. Number may begin with 0 (octal), 0x (hexadecimal) or a + sign. x, X Reads an unsigned hexadecimal integer. [ Reads a string of characters that are included within square brackets. For example, "[abc]" will read all characters that are either a, b, or c. Use "[^abc]" to read all character that are not a, b, or c. If the first character after "[" or after "[^" is "]", the closing square bracket is considered to be one of the characters rather than the end of the scanset. I thought that writing a scanf() replacement for .NET would be a cool little project. So I created the ScanFormatted class (shown in listing 1). It is not entirely compatible with the C standard. For starters, there are actually several slight variations on the scanf() implementations available today. Also, some changes were necessary in order to run on the .NET platform. For example, pointer types are not supported. Another thing that changed is the way parsed variables are returned. scanf() takes a variable number of arguments that get populated with the parsed fields. .NET allows a variable number of arguments using the params array. Unfortunately, while the entire params array can be passed using ref or out, there is no way to do this for each of the arguments in the array. So I added a Results collection to the class instead. This collection is of type List<object>. After parsing a string, this collection contains all the variables that were parsed. While it may not be exactly like scanf(), I did make an effort to come reasonably close to the C standard. For simple format strings, the parser should work almost identically. For some more complex format strings, some changes may be necessary. The ScanFormatted class makes use of my TextParser helper class. You will need it to use the code below. All source code and a test program is included in the attached download. /// Attempts to parse a field format specifier from the format string. // exception, we use TryParse() here instead of Parse(). I hope some people will find this code useful. I've seen quite a few posts on the web either asking if there was a scanf() replacement for .NET, or just asking how to parse text that could easily be parsed by this class. If nothing else, it was an interesting little exercise for me to write.